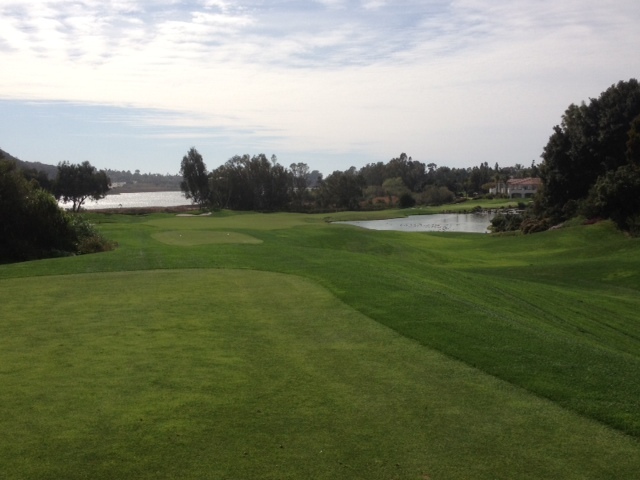 As finishing holes go in San Diego, few, if any, come much tougher than No. 18 at Aviara. This dogleg right par-4 wraps around a lake that runs along most of the fairway and to the green, providing a serene and aesthetically pleasing finish, but also one that’s been known to swallow a lot of golf balls. 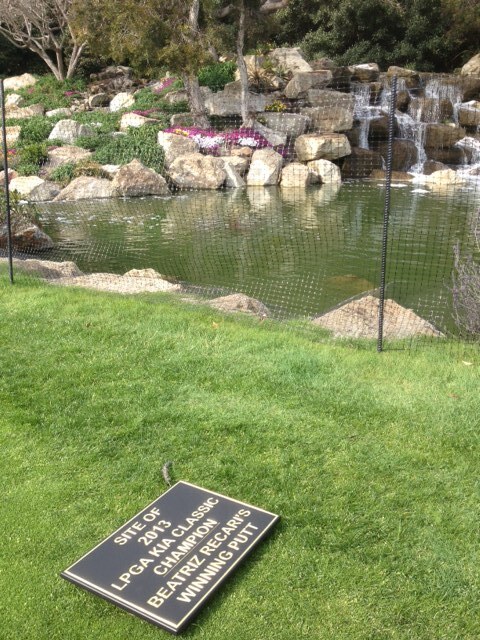 This hole was a major factor in the LPGA’s KIA Classic last year and not just because it hosted the two-hole playoff won by Beatriz Recari. It played as the toughest hole of the tournament, averaging well over par. Aviara Director of Golf Renny Brown says the hole plays unusually tough for the tournament because of a unique circumstance. The wind on 18 blows off the Pacific Ocean and Batiquitos lagoon, making it play even longer than the 413 yards from the blue tees, which is what the Kia uses. The tee shot alone is challenge here to say the least. Besides water on your right, you’ve got out of bounds and bunkers lurking on your left. With the wind blowing, this fairway can feel very small. According to a review of Aviara at worldgolf.com, Arnold Palmer once described this as the toughest finishing hole he’s ever designed. It quoted Palmer as saying, “You have the lagoon on the left and a pond and waterfall to the right. Even if you hit a strong drive, you have to think on the approach, because the fairway narrows to 20 yards. At the Kia media day, Recari offered her professional opinion on how to play 18 from the tee. “You have to play to the right, just inside the bunker,” Recari says. “I usually hit driver, but I hit 3-wood there last year (in the playoff) because the wind was up. Recari plays a draw, as do I, which makes a driver a nervous play here for me. I took Recari’s advice on media day and pulled 3-wood. I hit the best shot I’ve ever hit on 18 and, though a little too close to the lake, I had 160 to get home and a good lie. And then … yank. OB. I’ve done this the last three times (grrr) I’ve had played this hole. I suspect the wind is at work, though it mostly factors in in that it leaves me one club longer than what I’d prefer – my 7 iron. Therefore, unfortunately, I can’t speak to going for birdie or par here, but Brown has a tip about reading putts on 18. Speaking of putts, new this year is a plaque on 18 honoring where Recari hit her winning putt from the fringe last year. As well all know, hitting Aviara’s helipad-size green is one thing; putting them is another. And given how straight the female Tour players hit it, putting is everything at the Kia, Brown says. While 18 has a fierce reputation, Brown says it’s actually the second of closing one-two punch for the women, given that No. 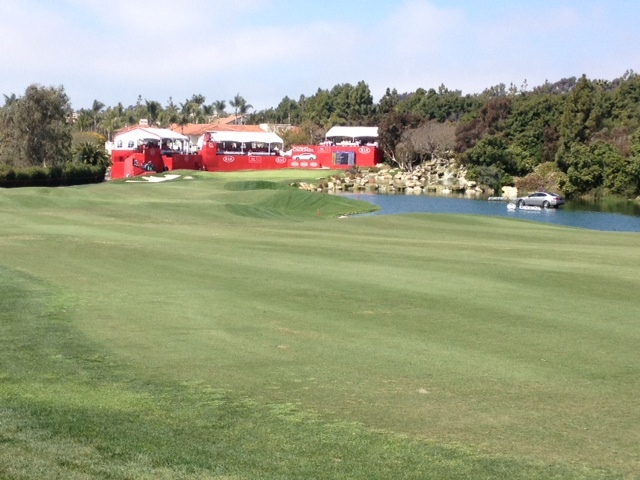 17, a par-5, is the longest hole on the LPGA at 565 yards. That leaves the drivable par-4 16th as the best last stand for birdie. Because if it comes down to 18, you’re really going to earn it. For my part, I plan to stake out 18 this week until I see a birdie, just to see what one looks like there. And while I’m waiting, maybe I’ll go see if any of my old approach shots are still buried beneath the brush on the Batiquitos trail. This entry was tagged Arnold Palmer, Aviara, Beatriz Recari, Kia Classic, LPGA, No. 18, Renny Brown. Bookmark the permalink. So excited to follow along this week and walk the course! I’ll be paying extra close attention to 18 now!